$15.00 "Marshals of the Soviet Union"	Russian text, catalog of brief biographies of all marshals of the Soviet Union, b/w photo for each plus a section of color photos of memorabilia. $45.00 "Commanders of the Armies, Great Patriotic" a Biographic Encyclopedia. Abramov, Ageev et al. C. 2005, Moscow. Russian text, hard cover, 406 pp. Part of the 4-volume "Great Patriotic" series. Outstanding comprehensive reference, and the first of its kind. $110.00 "Commanders of the Corps, Great Patriotic" Biographic Encyclopedia, 2 Volumes. I. Basik, B. Vedenskiy et al. C. 2006, Moscow. Russian text, hard cover, 670 pp and 462 pp per volume. These books are a part of the 4-volume "Great Patriotic" series. $75.00 Soviet WW2 Order of Battle, titled "Active Army, Great Patriotic" Nikiforov, Fesenko, Andronnikov et al. C. 2005, Moscow. Russian text, hard cover, 663 pp. Part of the 4- volume "Great Patriotic" series. A magnificent, encyclopedic reference book. $55.00 "Admirals and Generals of the USSR Navy in the Period of the Great Patriotic War and the Soviet-Japanese War (1941- 1945)", Vyacheslav Lur'e. Russian text, capsule history of ALL Soviet navy admirals. $19.00 "Soviet Order of Battle, WW2, Volume 2: School of Battle. Soviet Tank Corps and Tank Brigades, January 1942 to 1945". English text. $19.00 "Soviet Order of Battle ,WW2, Volume 3: Red Storm. Soviet Mechanized Corps and Guards Armored Units, 1942 to 1945. " English text. $19.00 "Soviet Order of Battle, WW2, Volume 5: Red Sabers. Soviet Cavalry Corps, Divisions and Independent Brigades, 1941 - 1945." English text. $19.00 "Soviet Order of Battle, WW2, Volume 6: Red Thunder. Soviet Artillery Corps, Divisions,and Brigades 1941 - 1945". Including Rocket, Antitank, and Mortar Units, English text. 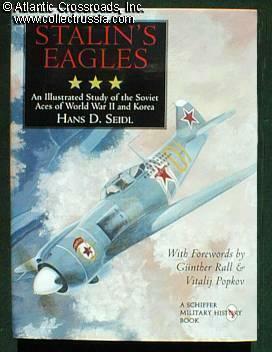 $19.00 "Soviet Order of Battle, WW2, Volume 8: Red Legions. Soviet Rifle Divisions Formed up to June 1941". English text. $19.00 "Soviet Order of Battle Volume 10: Red Swarm. Soviet Rifle Divisions Formed from 1942 to 1945". English text. $19.00 "Soviet Order of Battle, WW2, Volume 12: Red Hammers". Soviet Self-Propelled Artillery and Lend Lease Armor, 1941-45". English text. $19.00 "Soviet Tactical Doctrine in WWII. As found in: Handbook on USSR Military Forces TM-30-340" with forward by S. Caza. A reprint of a WW2 US War Department Manual with excellent general information on Soviet ground forces and tactics. English text. $19.00 "Eastern Front Combat, The German Soldier in Battle from Stalingrad to Berlin", Hans Wijers, editor, English text, Soft Cover, 368 pages, 25 photos; truly riveting first-person German accounts of combat with many never-before-seen photos. $69.00 "Kursk 1943. A Statistical Analysis", by N. Zetterling and A. Frankson	C. 2000, English text, hardcover, 270 pp. $12.00 "Kursk, Hitler's Gamble, 1943", by Walter S. Dunn Jr, English text, soft cover, 208 pages, History's largest armored battle, based on declassified Russian documents and captured German records. $22.00 "Red Army Tank Commanders: the Armored Guards", by Richard Armstrong. English text, hardcover, 476 pages. $20.00 "Red Army Legacies, Essays on Forces, Capabilities & Personalities" by Richard Armstrong. English language text. $19.00 "Tigers in the Mud, The Combat Career of German Panzer Commander Otto Carius". English text, soft cover, 368 pp., 51 b/w photos, 50 ill, and 3 maps. Carius won the Knights Cross with Oak Leaves during WWII.